Mmmm… I really love soup, especially when its cold outside! 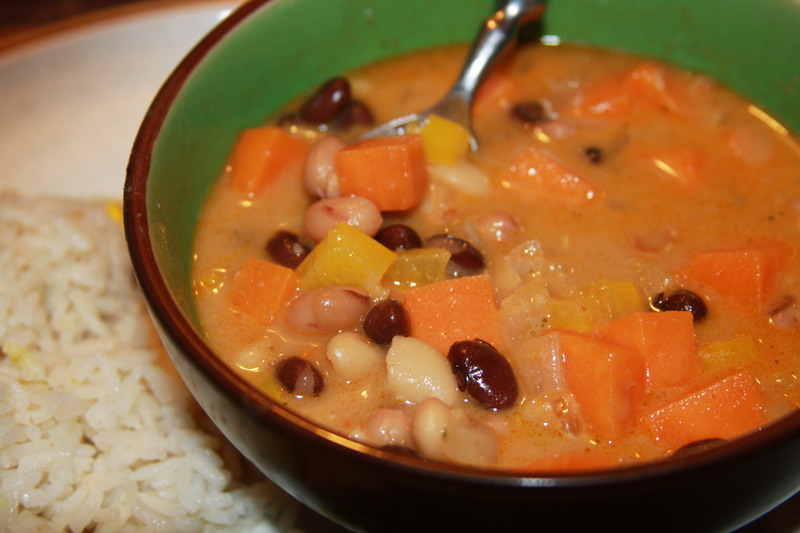 This is the first time I made this African Sweet Potato Soup with Peanut Butter, Black Eyed Peas and Beans and it turned out so delicious! 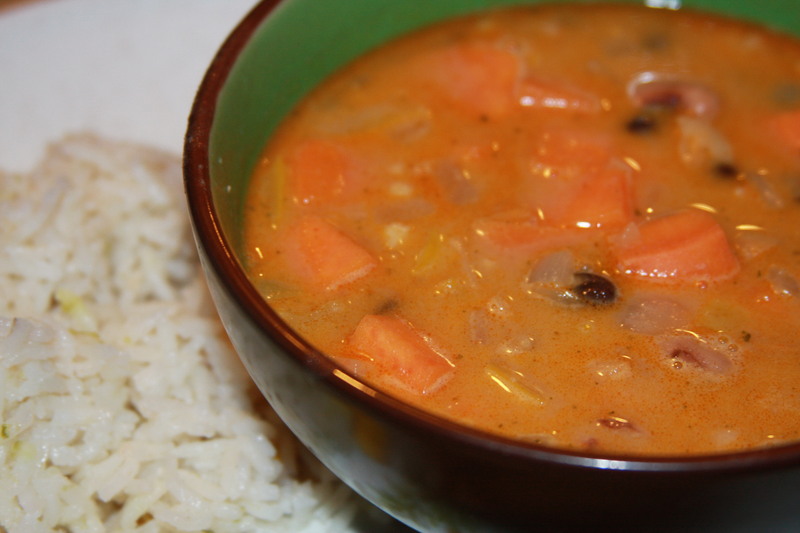 This soup is also gluten free, and makes a great hearty bowl if you are having company. This could easily be a New Years dish since it contains black eyed peas… Perhaps next time I make this, I may try adding in some greens! I was pleased that my kids tried and (more or less) liked this soup. My son scooped his bowl clean… I think he could sense that it contained peanut butter (hahaha) which is one of his favorite foods! My daughter wasn’t as big of a fan, but she did finish her bowl for me. I am a sucker for peanuty soups… especially ones like this. It makes about 4 adult servings. We served ours with a side of coconut jasmine rice, which the kids always love! It would also be great with some cornbread. The peanut butter can be substituted for almond butter or sunflower seed butter if you have allergies. 1/2 cup 100% natural peanut butter + 1/2 cup hot water (to equal 1 cup) I recommend using chunky peanut butter to give it a little extra texture and crunch in the soup. 1) Heat the olive oil in a soup pot. Add the curry paste and cinnamon; stir for a minute to mix the pol with spice. Add the onion, garlic, sweet potato, yellow pepper. Stir and cook the veggies for 5-7 minutes, until softened. 2) Add the black-eyed peas, white and black beans, broth, melted peanut butter, red pepper flakes and cilantro. 3) Bring the soup to a high simmer, cover, and lower the heat. Keep the soup on simmer and cook until the vegetables are tender, 25-30 minutes. 4) Stir in the lime juice and sweetener. Season with salt and pepper to taste. Garnish with cilantro, if you please! This delicious soup is packed with flavor AND protein! P.S. This soup could easily make a ‘Dinner and a Movie’ night with Disney’s ‘The Jungle Book’. That was kinda my original plan. My kids love hearing about different places in the world (in this case, Africa) and how different people live and how our lifestyles are alike or different. It makes for a great educational conversation! However, somehow on this night we got sidetracked & we never got around to putting in the movie!